Unless otherwise noted, all the text content of this website has been researched and written by BPA Media Director Kathleen Kouril Grieser. BPA Vice President Alex Beam contributed the site’s home page essay. The beautiful photograph adorning our masthead was taken by Dan Brody of the Newton Conservators (link). Birdwatching expert and blogger Dan Levenson contributed the essay entitled “The Birds of Bullough’s Pond”. Beth Wilkinson and the Crystal Lake Conservancy (CLC) kindly allowed us to republish Beth’s article about animal waste pollution of our lakes and ponds. Janice Bourque, Schuyler Larrabee, Srdjan Nedeljkovic and Debby Carr of the Crystal Lake Conservancy generously gave us frequent advice and encouragement. Sara Goldberg, archivist for Historic Newton, assisted with photo research. Much of the historical information published on this website is based on the excellent record-keeping of Bill Leitch and the writings of Peter Konde, the BPA's historian. 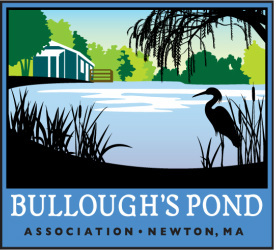 The Bullough’s Pond Association’s beautiful new logo was inspired by that of the CLC, and created by Diane Fassino of Fassino/Design. Diane created all logo-related graphic assets and assisted with the look of the site's masthead. The site was constructed by Kathleen Kouril Grieser and Ben Miller based on wireframes created by Kathleen Kouril Grieser. ©2013-2017. Bullough’s Pond Association. All Rights Reserved.